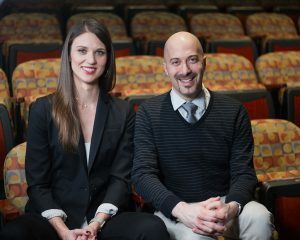 Read more about Theater J’s leadership team. Adam Immerwahr is the fourth Artistic Director in Theater J’s history. He was most recently the Associate Artistic Director at McCarter Theatre Center in Princeton, NJ. NYC directing credits include productions at The Public, Theater Row (both for Summer Play Festival), Ensemble Studio Theatre, The Wild Project, and NYU’s Studio Tisch. Internationally, he Directed the African premiere of The Convert in Zimbabwe (nominated for the National Arts Medal Award, Zimbabwe’s highest arts award). He has Directed and developed work for McCarter Theatre, Luna Stage, Hangar Theatre, Bristol Riverside, Premiere Stages, Playwrights Theatre of NJ, PlayPenn, the National Constitution Center, Philadelphia Artists’ Collective, Princeton Summer Theater, Westminster Choir College, Theatre Masters, and Passage Theatre Company in Trenton, where he serves as Resident Director. Adam is the recipient of a 2008 Drama League Directing Fellowship and the 2010 NJ Theatre Alliance “Applause Award.” Adam was the winner of the 2014 Emerging Nonprofit Leader Award presented by Fairleigh Dickinson University’s Center for Excellence and the Center for Non-Profits. www.AdamImmerwahr.com. Jojo Ruf is the newly-selected Managing Director of Theater J. She joined Theater J after serving as the Managing Director of The Laboratory for Global Performance and Politics at Georgetown University for four years. Prior to The Lab, Jojo worked for the National New Play Network for five years and served as the Associate Executive Director for two years. Jojo was the founding Executive and Creative Director of The Welders, a Helen Hayes Award-winning playwrights collective in Washington, DC. She was a Coordinating Producer for the 2015 Women’s Voices Theater Festival, and has worked with Arena Stage, the Kennedy Center, Ford’s Theatre, and the Provincetown Tennessee Williams Theater Festival. Jojo is in her third year of serving on theatreWashington’s Advisory Board. Most recently, her work has taken her to Cuba, China, Chile, Israel, Poland, Peru, the United Arab Emirates, Canada, and throughout the UK, among other places. She will graduate from Georgetown’s McDonough School of Business with an MBA in the spring of 2019.